Bodybuilding has been a big part of my family’s life. About a year after my father introduced me to weight training he got my brother, Johnny, started on a muscle-building regimen. The muscles came naturally for Johnny and as the years passed by, he developed a physique worthy enough to step onto any local muscle dais. Johnny was also a heavy bench presser who could out-lift just about anybody at the gym. Later in life, he raised two sons named John and Nicholas. The brothers also shared the same passion as their father and followed his example by training alongside him in the gym. Domenic was next in line. Although thin, he too started at a young age to develop his body to the max. In time his physique became muscular and his pressing power explosive. In the 1970s, I introduced Domenic to the fitness industry. I watched his knowledge in the field grow as he managed several health food stores within the metropolitan area as the years went by. Eventually, Domenic’s connections in the industry would help bring many sponsors to the shows that I promoted. Domenic also has a daughter named Stephanie who made fitness a big part of her life through the sport of karate (where she is a ranking black belt). Domenic’s x-wife, Cynthia, is also a black belt. One day she demonstrated her striking technique with a broomstick by hitting me several times across my left wrist as I blocked her unprovoked attack (long story). Since Johnny, Domenic, and I started training at such young ages it came as no surprise when our eight-year-old brother, Philip, took to the iron so early in his bodybuilding career. At first, Philip trained in our home’s basement gym but eventual made his way to my club when he turned ten. Three times a week, my mother would drive him to the gym straight from school to train under my guidance. For the first couple of years, he trained with light weights and performed high repetitions, using a complete range of motion for all exercises. As his muscles began to take shape, I increased the poundage while lowering the repetitions and had him taking more rest between sets. Eventually he became an advanced bodybuilder and trained instinctively to further continue his gains. Other than myself, Philip (see photo) is the only other person in my family who has competed in a physique competition. 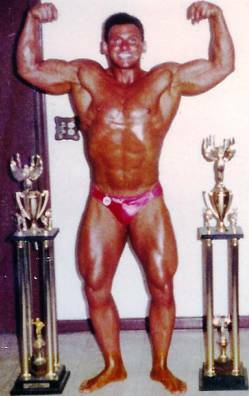 Philip entered his first bodybuilding show at the age of thirteen. He competed in the 1982 Mr. Staten Island show. While posing at the evening finals the crowd continuously cheered him on. It motivated Philip so much that he continued posing until the show’s expediter ran out of patience, walked onstage, grabbed Philip by the neck and yanked him away. This little incident did not detract Philip from future competitions. He went on to take home a number of trophies. However, this was not the first muscle mishap for Philip. A year earlier, Philip had a post workout accident at my gym. After completing a high intensity training session with his workout partner Keith Miguel, he challenged Keith to some friendly competitive posing to finish their day’s efforts. They went at it, pose for pose, flexing their physiques with all their sweat and might for nearly twenty minutes. Neither would give in, until suddenly, Philip collapsed from not breathing correctly and smashed his head onto a 25-pound Dan Lurie weight-plate that was lying on the floor. The impact was so hard that it left an imprint of the weight-plate engraved on Philip’s forehead. He was out cold and it took a few minutes before he got some of his senses back. Needless to say, I was shaken up a bit and was relieved when Philip returned to his feet. The next day you could still see the etching of the weight-plate on his forehead. But he still came to the gym for another heavy-duty bombing session. In his twenties, Philip was still heavily into bodybuilding and went on to open several personal training and diet centers. Being a well-known bodybuilder on the Island, he had a large clientele and was continuously sought after by those seeking to increase muscle mass and become fit. Another member of the Strong family would find her way to the gym in the early 1990s. During her teenage years, my sister, Carmela, tagged along with me to Gold’s Gym on Staten Island. We trained together four times a week for several hours at a time. Gold’s was a great gym for her to first experience the sport of bodybuilding. She made fantastic gains within a relatively short period of time. Carmela was consistent with her training and showed no fear when pushed to new limits (see photo). Before we knew it, she was representing the family name proudly. She was Bench Pressing 155 pounds and Leg Pressing 450 pounds with ease for multiple sets and reps. Like her brothers before her, she was a natural for the iron and soon found herself giving advice to others about the benefits of natural bodybuilding. Today, Carmela continues with her weight training and maintains an athletic physique.